The SPDR Gold Shares ETF (GLD) have been tracking steadily lower for the last six months. There have been attempts to stabilize along the way, but they all failed and the erosion in the precious metal continued. Over the last month, however, the ETF has stabilized and formed a pattern on the daily chart which suggests a preliminary step in an attempt at reversing trend may be underway. 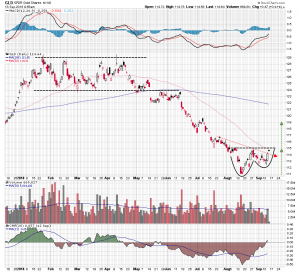 A cup and handle pattern has formed on the daily chart under rim line resistance in the $115 area, which is currently intersecting with the declining 50 day moving average. Moving average convergence/divergence made a bullish crossover last month and has continued to track higher. The real technical improvement is in money flow. Chaikin money flow has been moving higher for the last 30 days, starting from a very low level. This week it moved back into positive territory for the first time in several months. This suggests the GLD is no longer being sold and it is the first sign of buying interest. 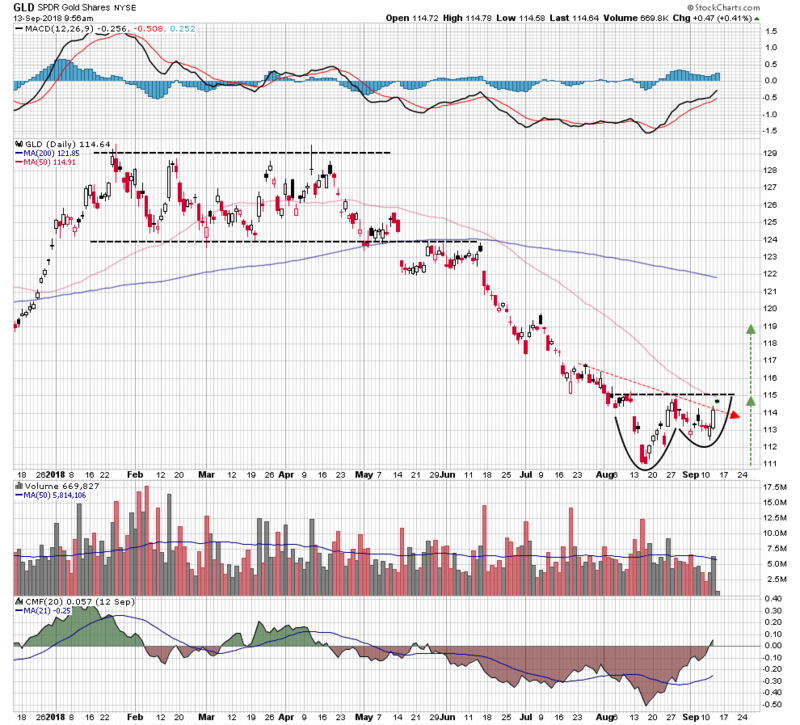 A confirmed break above the cup and handle rim line projects a pattern measured move to the $119 area. This is only a 3.5% move but it changes the structure of the chart, and points the way ahead for the precious metal.